Do you go trick or treating with your dog? Some people do. And Jones is making it even easier to go trick or treating with your dog. Here are the 5 steps to trick or treating with your dog that will have your dog eating out of your hand. 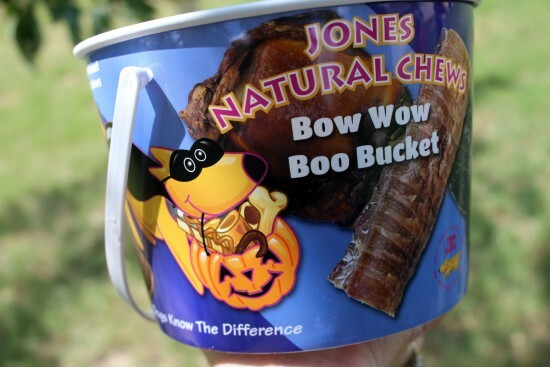 The Bow Wow Boo Bucket from Jones Natural Chews – made specifically for good dogs, and designed to make dogs smile. This is the perfect bucket for carrying your dog’s treats on Halloween. And we’re currently giving a bucket away to one lucky dog! First and foremost, make sure your dog is on a leash. Your dog may be great off-leash, and you may be in a rural area where there are no leash laws, but Halloween is a different night for everyone. It’s safer for you, your dog, and everyone involved, if your dog is on a leash. My dogs will be wearing harness and matching leashes from The French Dog (which has super cute Jack O’lantern collars right now!). PLEASE bring poop bags and use them! I use Earth Rated poop bags when the dogs are out and about, but there are quite a few bags on the market now. No one wants their tiny princess to step in poo. Be a good neighbor and scoop the poop! Also, take some handy wipes for clean up, just in case. Slip them into the Jones Natural Chews Bow Wow Boo Bucket before leaving the house. Find dog-friendly trick or treat spots. If you’re going trick or treating with your dog, you want to make sure that there are places you can take the dog that will give you treats! Because you want to keep ALL candy away from your dog, dog treats are best. Fruit is also a great treat for your dog, as long as it’s NOT GRAPES. Do a Google search with “dog friendly trick or treating”, and include your city or state in the search criteria. I think you’ll find some great places to take your dog. Make sure you include 2015, since the past is a fixed thing online. KNOW YOUR DOG. I say this for a couple of reasons a) your dog may or may not be friendly toward children, and Halloween is a busy night, children everywhere; b) your dog may be extra grabby, wanting to snap up candy and treats it shouldn’t have, things which might harm or kill your dog if ingested. Please only take your dog trick or treating if you know it can handle the crowds and attention, because children want to pet dogs. Or run screaming from them. That dog friendly search? Trick or treating with your dog might be best done before or after Halloween. Your read that correctly. Quite a few large cities in the USA have trick or treating events for dogs which happen before or after the actual day, or in the afternoon on Halloween. This allows dog owners to enjoy each other’s company without the press of Ninja Turtles, Elsa from Frozen, and Iron Man. Masked children crowding around can be nervous making for a dog. These planned events are more likely to have dog appropriate treats, as well as water bowls and poop bag receptacles. Look for one where you live. In fact, Halloween is more than a month away. If there’s not a dog friendly Halloween event in your town, why not make one happen? You can do it! So are you taking your dog trick or treating this year? I’ll be taking Chewy and Gadget trick or treating, but in Atlanta, and a few days after Halloween, at the BarkWorld blogging conference. They’ll be decked out in cute outfits, wearing tie dyed harnesses and collars from The French Dog. Currently working on their costumes. This is what Chewy wore last year. Chewy doesn’t care to wear things on his head. He freezes. I’ll be putting hats on his wee head for the next month, trying to get him to keep one on. Two things – if you haven’t already, enter the giveaway for the Bow Wow Boo Bucket. It’s a great bucket for trick or treating with your dog, and it’s full of all natural, grown and made in the USA meat treats. 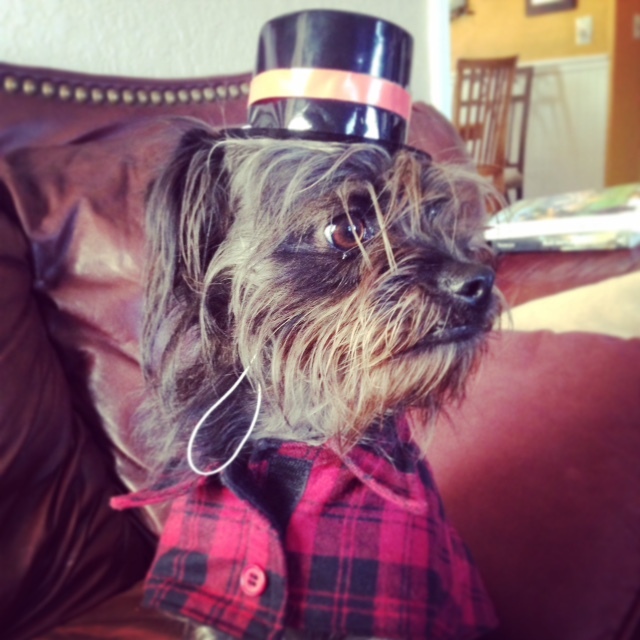 Two, tell me if you’re taking your dog trick or treating and what they’ll be wearing!